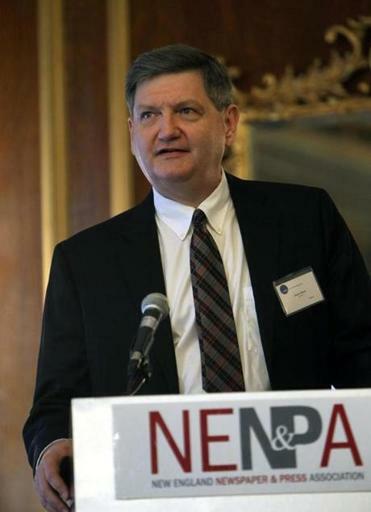 New York Times reporter James Risen was given a First Amendment award. He never thought it would come to this, but James Risen is prepared for jail. Through two presidential administrations, Risen has resisted the US Department of Justice’s attempts to get him to reveal the identity of an anonymous CIA source. His refusal to testify and commitment to a free press as a check on government earned him an award Friday from the New England First Amendment Coalition . “There’s no one anywhere on the vast landscape of American journalism who merits this award more than you do,” Northeastern University professor Walter V. Robinson, a former Globe Spotlight Team editor, told Risen in presenting the Stephen Hamblett First Amendment Award. Risen shared a 2006 Pulitzer Prize with colleague Eric Lichtblau for a New York Times series reporting the federal government’s secret domestic eavesdropping program. That same year, Risen’s book “State of War” included an anonymously sourced chapter on a botched CIA operation to disrupt Iran’s nuclear program. The government ultimately indicted Risen’s suspected source and subpoenaed Risen to testify, an order upheld last year by a federal appeals panel and by the full US Court of Appeals for the Fourth Circuit. Risen’s lawyers asked the Supreme Court last month to recognize his right to protect his source. If the high court declines to take the case or rules against Risen, he must take the stand or risk jail. Risen said he has tried not to let that deter his continued reporting, and he has drawn strength from family and colleagues in the news media. But she struck a serious note about his work, calling it vitally important to the public, while hailing his integrity and perseverance. “Jim continues to do what he always does, which is to report, listen to sources, honor the information they bring to him, check it out, and report newsworthy issues of importance to the public in a fair and deep and probing way,” she said. For Risen, the Hamblett Award, named for a former Providence Journal publisher, represented a homecoming of sorts; his first journalism job came as a Brown University stringer for the Journal in the 1970s. By the 1990s, Risen was covering national security, catching what he called the end of a “post-Watergate golden era” of reform, transparency, and belief in the role of an active press. That changed after the 2001 terrorist attacks, with the public willing to cede civil liberties as the government engaged in a secretive, taxpayer-funded war on terrorism, Risen said. Our understanding of elements of that war, be it wiretapping or drone strikes, has come through reporters and whistleblowers, he said. “That, to me, is what’s at stake and what I’m trying to fight for,” Risen said.